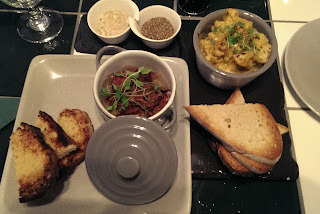 We are delighted with this recent write up by Mark Dredge, beer writer and author of Cooking with Beer on his recent visit to Wahleeah where BBB consulted on the food and beer pairings. This blog originally appeared on Mark Dredge’s blog pencilandspoon.com and has kindly been republished here with Mark’s permission. Yesterday I had beer-cured bacon with bacon stout ketchup for breakfast. I’d started making it a week earlier, brining belly pork in smoked porter, brown sugar, maple syrup and salt. I took the pork out of the brine on Friday morning and left it to dry out in the fridge, then cut thick rashers and fried them, the sugars caramelising, the beer giving a toasty, smoky flavour, and the pork itself more porky in depth through the curing process. It was delicious. That bacon was something like the 75th recipe I’d cooked incorporating beer this summer (and a very big clue to what my fourth book, out next spring, is going to be…). So when I heard about Wahleeah, a restaurant specialising in using beer as an ingredient, I planned to go as soon as I could, which was last night. And I discovered that Wahleeah is way more than just cooking with beer. Take the salt and pepper, for example. The pepper on the tables contains 11 ingredients. The salt takes three days to produce and contains horseradish and a process that involves smoking water. Diners shouldn’t even need to use them, says chef Dave Ahern, but if he has to have salt and pepper on the tables then he wants the best he can get with an exact flavour, and it turns out the only way to get that flavour is to make them himself. This obsessive level of detail is in everything – Dave makes cheese, vinegar, condiments, and more, for the restaurant. Beer is just one small part of it. But for me, the beer part is the reason I’m there. Having spent the summer cooking with beer, I know all the good and bad things about what happens when you add beer into a recipe and I want to see what Wahleeah has done. Oxtail and onions cooked in Fuller’s Black Cab Stout is rich with beer, full-on meaty with the onions giving a nice sweetness. There’s delicious crab cauliflower cheese, perfect with the suggested pairing of Weihenstaphaner Hefeweizen. There’s also beer-cured salmon with house pickles, stuffed mushrooms with beer and soy, a beer chilli to go on tater tots. Larger plates include mussels in witbier with the addition of deeply-savoury ham hock, where it pretty much demands the beer on the side to act like part of the recipe, giving a freshness to lift the richness. A huge rib-eye steak comes with a brilliant beer fondant potato and a stout sauce, where that table salt and pepper gives it a remarkable extra depth of flavour (and recalls one of my favourite ever beer matches: steak, parsnip fries, horseradish sauce and oatmeal stout). There’s also ricotta dumplings with beer butter, tuna meatloaf with bloody beer sauce, bream with beer-braised fennel. 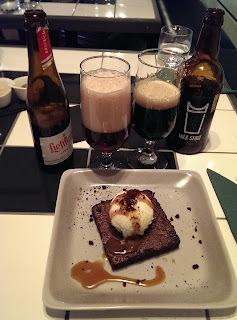 Then desserts: chocolate stout brownie with banana beer ice cream is superb and perfect with a bottle of Liefman’s Kriek, there’s also Porter cheesecake and Oreo trifle. It’s all big-flavoured but elegantly done; next-level pub food incorporating the pub’s most central drink, but it’s not all about the beer – these are just great dishes that happen to contain beer. I love that Wahleeah is taking beer seriously – that’s the best thing about it for me. 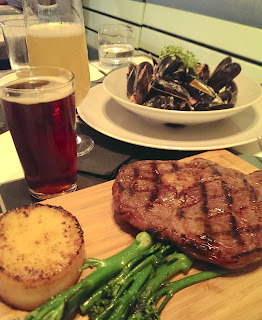 I love that the food is very good and I love how the beers used in the cooking enhance the dishes in their own subtle ways without ever overpowering – they are additional seasonings, they add depth which other ingredients can’t add, they give their richness, and they compliment the food. I also love how each dish comes with a beer suggestion – and that those matches are very well selected (done by Boutique Bar Brands). It makes the beer important and it encourages people to try new beers. And it has around 12 draft beers and 50 bottles, so there’s a lot of choice. These are all good things. Wahleeah is the first restaurant in the world to focus so completely on beer cooking. This could be seen as a gimmick, a Cereal Café for beer nerds, but Wahleeah really is way more than just cooking with beer. Surprisingly more. You should go.